We are all still reeling from the damage caused by typhoon Ondoy - we have lost lives, houses, livelihoods and properties. Now that recovery has begun, we are looking forward to getting our lives back to normal. My next few posts hopefully bring some hope back - some reassurance that things will be better soon. What to do when your car is submerged in a flood? Images of cars and other vehicles floating in flood water or stacked over each other reminds me of the horror that was Ondoy. I was myself praying the water would stop rising on that rainy Saturday night - the water level reached up to our garage where our cars were, but thankfully it stopped right at my car's rear tires. A big issue on people's minds is car insurance. Unfortunately, normal comprehensive car insurance does not cover acts of God or natural disasters such as typhoons and floods. It is instead, an optional coverage. If you live in an area where flooding is frequent, it would be best to include this in your insurance package next time. It is a bit more money, but if you afford it, it will save you a lot of trouble in the end. 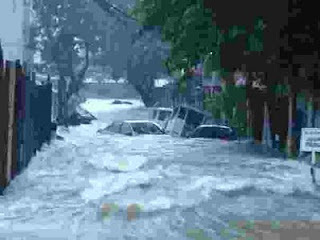 If you don't have flood and typhoon coverage, don't worry, there's hope for your vehicle. Read on and hopefully you can save your vehicles from further damage. I saw an email being circulated with some tips on how to salvage a submerged vehicle/car especially if the car engine was submerged in water. I think this very good information to share. (I just reformatted it a bit). In line with the recent devastation that our countrymen suffered due to flood, I would like to give some practical tips to those whose vehicles have been submerged in water. First, don't try to start your vehicle as this might short circuit the electrical connections and damage the computer module, if the vehicle is equipped with one. Let it stay and dry for a day or two. Have it towed to your nearest autoshop or if you have a trusted mechanic, have it serviced in your home. All consumables, meaning, fluids of the vehicle must be drained and changed: engine oil, transmission oil, brake fluid, steering fluid, water in radiator/reservoir, etc.). All filters (oil, fuel, transmission etc.) and spark plugs must also be replaced. Othe parts for replacement will depend upon the inspection and further testing by the mechanic. Of course, your vehicle will need interior and engine detailing. I hope these reminders will serve as your guide to prevent any further damage to your vehicle. God bless! hi reyjr., my hub just did; his car's at the shop now. ayos toh, makakatulong ng malaki ito, lalo nat hilo ngayon ang tao..agree ako kay jan. very useful post...simple pero mapapakinabangan post. Ano ulit ang tawag sa pinaglalagyan ng "jack?" He he he. Okay, since I don't have a car right now, I'll make sure to point your blog to those who would need to know how to deal with their submerged vehicles. Good Thing I don't have a car! Lols! Good Tips Bro! Gee, I hope to never experience that kind of flooding. It's scary and upsetting. BTW, I have been in the Insurance Industry for over 15 years, and if you can do the extra effort of paying the optional coverage, I highly recommend to do so. It should not cost a lot more, I think. Not sure about the pricing structure in the Philippines. Sorry about that. We will get back up again bit by bit eh? I just called towing service for my friend's car. They're up to their necks in service requests too. ;) At least now you know LJ. In case your apo's car get submerged in flood, you'll be the Lolo to save the day. Thank you Brian. If you or you know people who want to give donations for the victims, there are numerous agencies accepting donations like The Philippine Red Cross. I can imagine if my car was submerged in that flood, I would be devastated. Thanks Jhong! I think so too. Good tips that is. Maybe you can forward this to neighbors who have a car. Sayang naman kung lumala pa ang sira. Thanks Auntie - have you seen photos? If you look closely, you might see me in one of them. Great recommendation DiTesco. Hopefully people will read your comment and will consider it. I am thinking of doing the same for my car insurance renewal next month. I was somewhat shocked when I saw the footage online. So much water and mostly it's the poor people that had to suffer the worst.